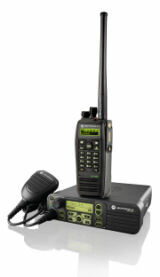 Tthe Motorola XPR 4580 features an integrated GPS module, alpha-numeric display, four programmable buttons, large volume knob for ease of use and a powerful, front-projecting speaker. The Motorola XPR 6550 features an integrated GPS module, full keypad with display, up to 1,000 channel capability, five programmable buttons, emergency button, IP57 specifications for submersibility and intrinsically safe options. Certified Intrinsically Safe: Certified as intrinsically safe by FM and CSA Approvals when purchased and equipped with a FM battery for use in hazardous environments. Integrated GPS: Track vehicles and assets without additional equipment to purchase, install or maintain. Customized Applications: Features the industry's largest third-party application developer program for customized applications such as work order tickets, system management, email gateways, man-down, location tracking, telephony, dispatch and much more.